Father Henry Carmona was ordained to the priesthood for the Diocese of Boise by Bishop Alberto Giraldo on July 20, 1978, in Cali. He served in parishes in Cali and in Idaho as an associate pastor at San Juan Bautista, Cali (1978-79) and St. Hubert’s, Homedale (1979). He served as pastor for San Juan Bautista (1979-81) and at San Marcos, Cali (1981-85, 1987-90). He was administrator of Our Lady of Guadalupe, Nampa (1985-86); St. Hubert’s in Homedale (1991), and Our Lady of Good Help in Mountain Home (2009-10). Father Carmona enrolled in graduate classes at the Universidad Javieriana in Bogota (1986-87, 1992), graduating with a degree in canon law. In 1992, he returned full-time to Idaho, serving as a pastor at Our Lady Queen of Heaven, Oreana, and Our Lady of Guadalupe, Nampa (1992-95) and St. Nicholas, Rupert (1995-2003), before being appointed rector at St. John Cathedral. He retired from active service on June 30, 2014. He went to his native country Colombia to take care of his aging mother. He was approached by Bishop Peter last May and asked him “How would you feel to help the Diocese of Boise and Holy Spirit Catholic Community of Pocatello. 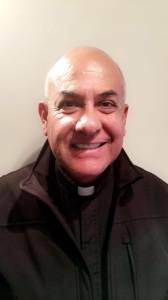 Besides his parish assignments, Father Carmona has served on the Priest Personnel Commission (1984-97, 2003-06); the Pastors Advisory Council (1995); the Presbyteral Council (as dean for the Southern region, 2001-03; 2006-11); and director of Treinen House (2006). Father Carmona also served as diocesan judicial vicar (1998-2014).